It's hard to imagine anyone is still dithering on who to vote for after Monday's radio debate between the two candidates vying to replace Gov. Jerry Brown. 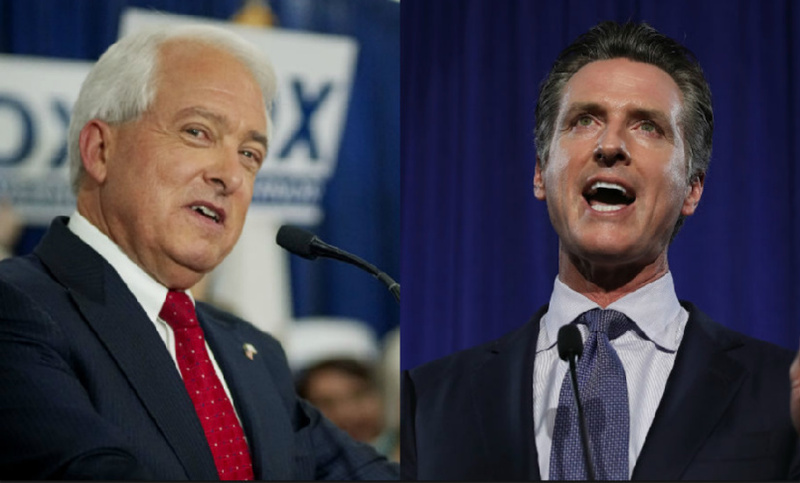 In their only scheduled post-primary faceoff, Democrat Gavin Newsom and Republican John Cox made their differences clear on key issues ranging from the border wall to the gas tax increase. If you do nothing else to bone up on your choice before casting your ballot Nov. 6, listen to a replay of the hour-long and wide-ranging conversation moderated by KQED senior political editor Scott Shafer. Newsom named wealth disparity as a top concern as he considers how he'll govern, which appears likely if the polls hold true. Under that umbrella, he listed housing, homelessness and healthcare, which he said is "devouring the state budget." Cox hammered away on the high cost of living in California, blaming the Democrats in power for failing to address the issues that he said are forcing people out of the state. Cox, a businessman and developer, said the cost of building in other states is a fourth or a fifth of that inside California. He called for eliminating and replacing CEQA, the California Environmental Quality Act, that he said attorneys use to stop development. Newsom acknowledged California's low housing production rate. But he went after Cox for what he characterized as the Republican's lack of specific strategies to address the problem — and touted his own proposals to incentivize local governments to create homes. He said a bit of punishment is also in order if local governments fail to meet their housing goals. Shafer asked Newsom about his past public spats with legislative leaders, including Assembly Speaker Anthony Rendon over a proposed universal, single-payer health care system. Newsom suggested a bill for the idea, while Rendom raised questions about its high cost. Newsom argued that he got along with most of the San Francisco Board of Supervisors and suggested that while he has had areas of disagreement in the past, he's learned from those experiences and now tries to get along to benefit the long game. Cox recognized the need for politicians to work together, although he was not asked specifically how a Republican governor might work with a solidly Democratic Legislature. Cox had his own moment of discomfort when asked asked about past conservative comments, such as disparaging remarks about transvestite teachers and gay marriage. "Those were very many years ago and I've evolved on those issues," Cox said. The two also differed on bills passed by lawmakers to give the public access to internal investigations of police shootings and police camera video of the shootings. Cox said he favors transparency but opposed the bills; Newsom countered that he didn't see how his opponent could be pro-transparency while opposing the measures. They also parted company on a bail reform bill passed by lawmakers that eliminates cash bail in the state. Newsom said he intends to follow the practices of Gov. Jerry Brown in backing criminal justice reforms, including the bail measure. Cox predicted the bill would create a need for more government workers to round up defendants who don't show up in court while eliminating the private bail industry. Cox and state Republicans have made a crusade out of their opposition to the recent increase in gas tax and vehicle fees for road and bridge repairs. He is backing Proposition 6, the statewide measure to roll back the increases. To address the need to pay for repairs and maintenance, Cox called for making CalTrans more efficient, citing California's high cost of repairing roads. Newsom said 27 states raised their gas taxes as California has done for road repairs and he dismissed Cox's idea that rooting out inefficiencies would alone be a viable option. One of the more interesting moments in the candidates' back-and-forth came as Newsom pressed his attack on Cox's support of President Trump and the border wall. Newsom said Trump's Supreme Court nominee Brett Kavanaugh will have long-term impact on California's policies on issues like reproductive rights, property rights, beach access, immigration and presidential powers. Cox dodged a question about how he would have voted on Kavanaugh. But he said he has four daughters and that Christine Blasey Ford, who accused the nominee of sexual assault when they were in high school, deserved to be believed. Kavanaugh has repeatedly denied the allegation. Toward the end of their hour together, Cox jabbed at Newsom for the frontrunner's reluctance to sign up for more debates. Cox noted that he was open to five debates but "can't get my young friend to do that."